The No Mad Bar with panoramic views of the Moroccan Atlas Mountains. 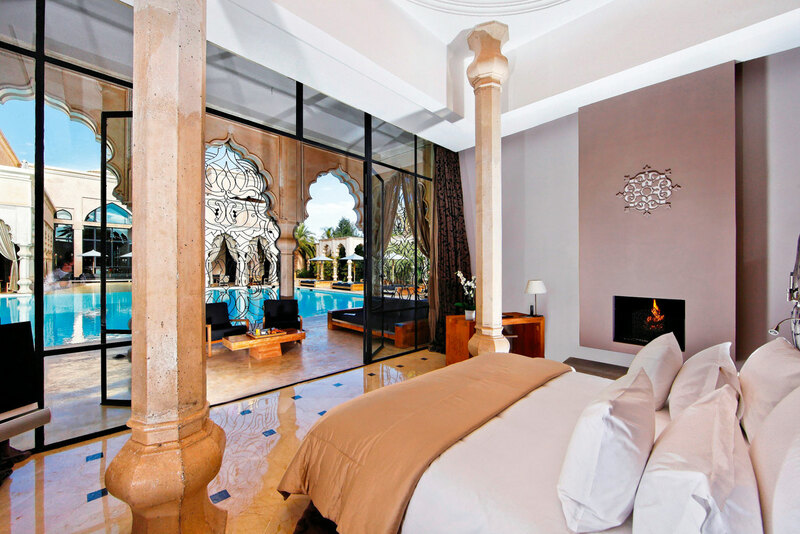 Inside the luxurious pool suites at Palais Namaskar. 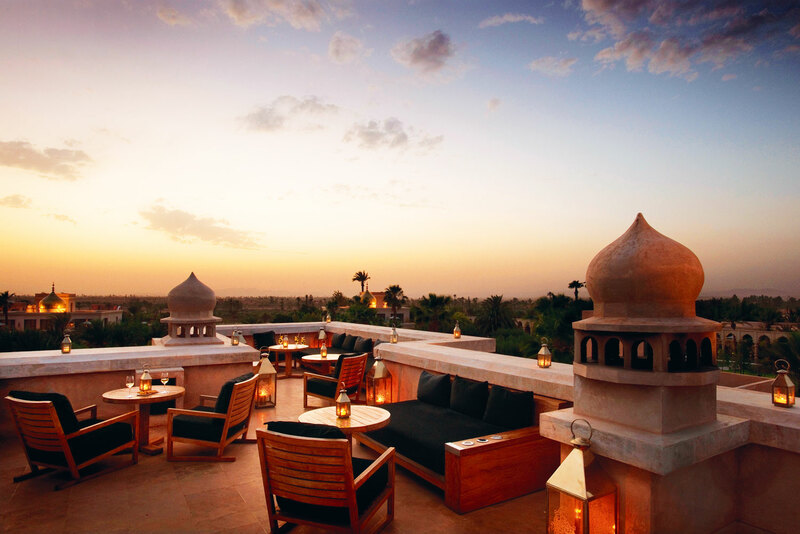 Palais Namaskar incorporates a gorgeous mix of exotic influences. 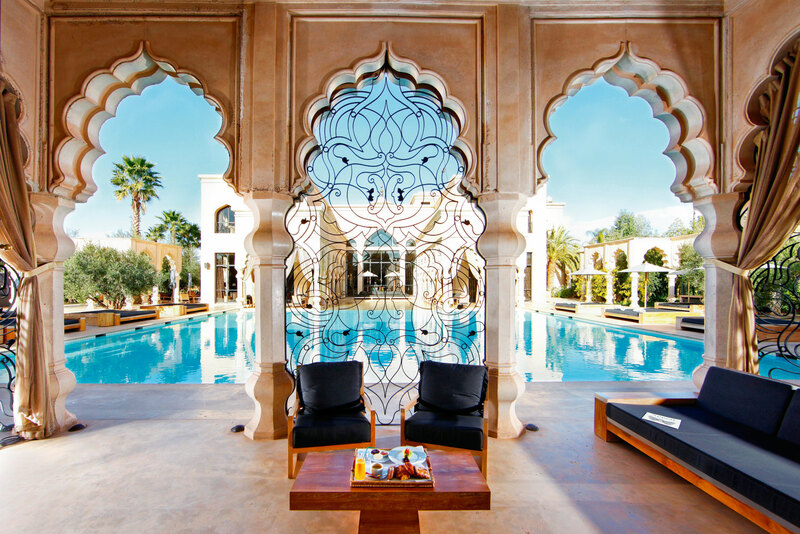 When your travels lead you to Marrakech, Palais Namaskar is the place to write home about; an exotic oasis nestled between majestic mountains and alluring desert in a city bustling with kasbahs and bazaars. The luxury hotel and spa is sublime; kind of like you’ve stepped into a mystic kingdom from a bygone era. The resplendent architecture is a striking mix of Moorish influences, with feng shui principles and Balinese gardens. In contrast, the interior design in the 41 room types – deluxe rooms, spacious suites, luxury villas and three palaces (yes, three) fit for a king – is contemporary and minimalistic. As though that’s not enough to sate your senses, there is a host of dining options to choose from too: fine French dining, casual poolside fare, intimate Thai cuisine and a rooftop bar under a dreamy Moroccan sky – all of which are under the watchful eye of Antoine Perray, former disciple of the great Alain Ducasse. There’s a long list of activities available for guests – from exploring the majestic Sahara by camel, to getting lost in the narrow, evocative alleyways of the world’s largest Medina. But even with such temptations on the doorstep, it will be an effort to tear yourself away from time spent simply lazing about your very own palace. Order a drink from the butler, soak in the private heated pool, gaze out to all 2000-square-kilometres of private gardens and tick ‘Arabian Night Fantasy’ off your bucket list.